Benzimidazole and its derivatives are regarded as an important heterocyclic motif that exhibits a wide range of pharmaceutical applications including anticancers, antihypertensives, antivirals, antifungals, anti-HIVs, anti-convulsants, and anti-diabetics. In view of their wide ranging activities, the synthesis of benzimidazoles and its derivatives remain a primary focus for synthetic chemistry communities. 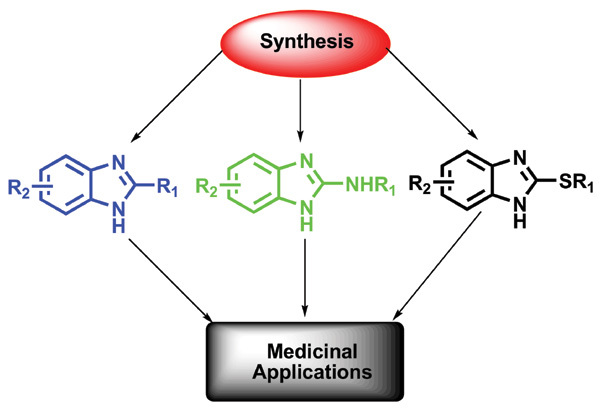 Till date numerous reports especially on the synthesis of 2-arylbenzimidazoles have been published but lack of knowledge on the detailed synthetic reports of two important derivatives such as 2-aminobenzimidazoles, and 2-(alkyl/aryl)thio benzimidazoles still persists. However, owing to fast developing benzimidazole containing new drugs numerous reports have appeared on the synthesis of this privileged scaffold. In this review, efforts have been taken to shed light on the latest informations available on the syntheses and applications of different benzimidazole derivatives. We have also tried to summarize the chemistry involved in the synthesis of various derivatives of benzimidazole for medicinal applications. Benzimidazole, green synthesis, biological activity, 2-arylbenzimidazole, 2-aminobenzimidazole, 2-(alkyl/aryl)thiobenzimidazole.